Free Shipping Included! Joagym Fat Bar Training Manus Grip Pro - The Best Powerful Arm, Biceps, Triceps, and Chest Muscle Strength Growth Builder by Joagym at Strongman Pictures. MPN: MGP-RED01. Hurry! Limited time offer. Offer valid only while supplies last. [Why Thick Bar Adapter?] Thick bar is harder to handle than normal sized grip that it requires more concentration to be effective while exercising. Thick bar is harder to handle than normal sized grip that it requires more concentration to be effective while exercising. Fat grip stimulate more muscle activation in hand, arms, chest, shoulder, etc. in record time. More muscle activation means bigger muscle and strength gained. Manus grip pro has the same shape as normal Manus grip, but with thicker diameter of 65mm(2.56inches), so it requires higher level of training and gives extremely powerful effects. Made pf high quality durable silicon that is possible for permanent use. Easily attachable to various weight training tools like, dumbbell, barbell, etc. GROW STRONG ARM SIZE & STRENGTH - More muscle activation means bigger muscle and strength gained. MANUS Grip helps you build strong arm and power by attaching to barbells, dumbbells, kettle bell, and cable handle by increasing their diameter. COST EFFECTIVE - Do not have to buy another thick bar or other thick handle tools. This great value item even costs less then protein powder or supplement. Grab yours today! BEST PERFORMANCE IN RECORD TIME - You do not have to spend many time to build up your arm, shoulder, or chest size. Manus Grip will lead you into best effective exercise in record time. 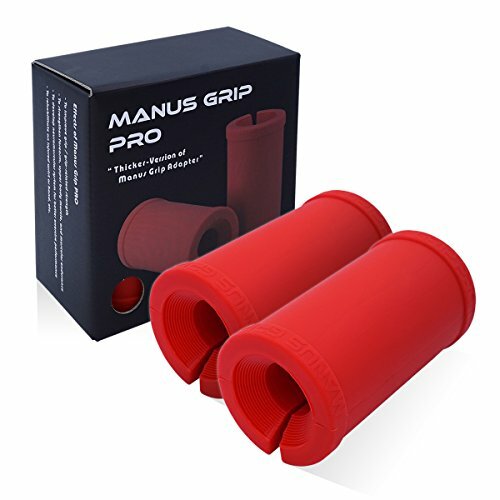 PROFESSIONALS RECOMMENDED - Manus Grip is being used many domestic and international athletes, arm wrestlers, weight trainers, strongman, and bodybuilder. It's time for you to join into thick bar training. HIGH GRADE SILICONE MATERIAL - Silicone does not discolored or hardened over time, so you DO NOT need to replace it. It is permanent use and easy clean. View More In Arm Machines. If you have any questions about this product by Joagym, contact us by completing and submitting the form below. If you are looking for a specif part number, please include it with your message. Ader Arm Blaster Pair (Buy One Get One Free) Group Buying Save!